Here’s my new work station.. No more proper table with book racks.. Hahahahah.. My new work station is at the laundry area near the kitchen.. 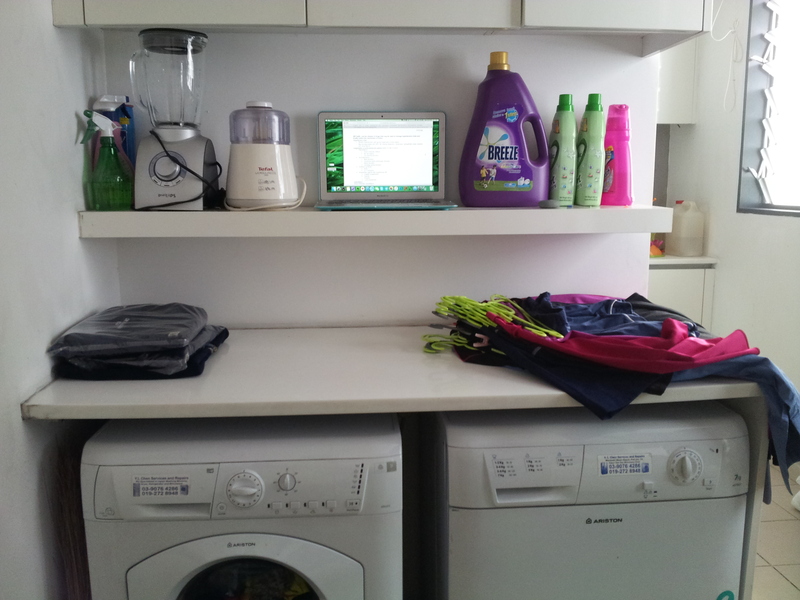 I do laundry, fold, ironing, shop online, pay bills, read notes while folding clothes here! A woman gotta do what a woman gotta do, right! It’s the weekend and that was my first batch laundry. More to come, that means the pile is gonna grow.. Hehe… Wish me luck! Posted on September 19, 2015 September 19, 2015 by Dr Halina Mohd YunosPosted in LifeTagged mommy stuff. Previous Previous post: A Little Project.. I dry my clothes on hangers in laundry room – must be well ventilated with windows opened otherwise you get that musty smell. Then straight to wardrobe without taking them off the hangers. All small items are thrown to drawers according to species – undies, camisoles, socks, little kids clothes, even old t-shirt & pants that I wear only at home, etc. I only fold towels & bedsheet. Hehe I am malas like that. It’s good to know you’re doing well, Halina.